Maybe it’s because I’ve spelled Khachapuri incorrectly like 1000 times and google is totally stalking me because of it… but these Georgian eggy cheese boats are taking over all of my social media feeds! And since I couldn’t deal with the lack of deliciousness in my life, I decided to put my FOMO to rest and made one for myself my friends. So what makes this magical dish so spesh? Imagine a flatbread mixed with a pizza mixed with a creamy soup-filled bread bowl. 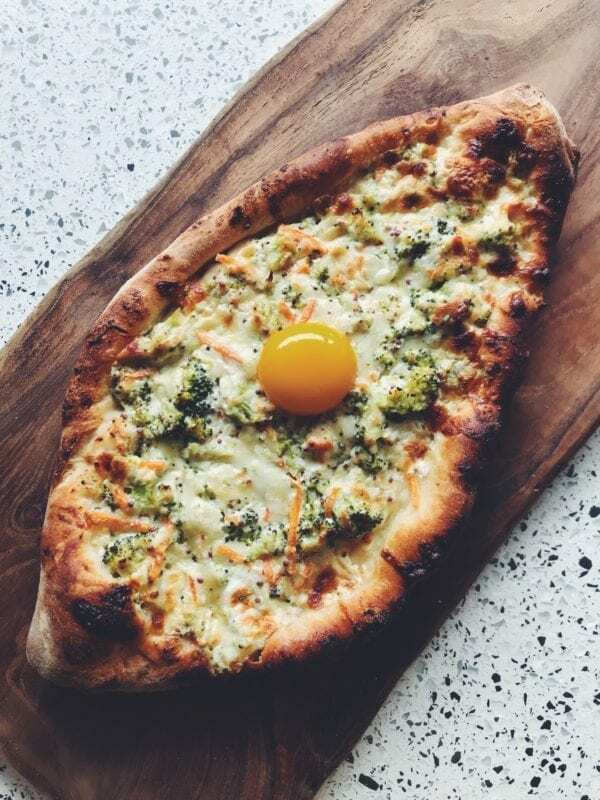 Khachapuri is basically the epitome of cheesy carby goodness with an egg on top. To eat it, you rip off the sides and use the crust to stir and scoop up the molten cheese that resides in the middle. It’s actually heaven in self-serving nacho form. Traditionally, these cheese boats are filled with a tangy sulguni cheese that I’ve never heard of before that’s basically impossible to find in the USA. Instead of searching high and low and freaking the f*** out about it, I decided to copy some other bloggers and swapped it out for some tart feta cheese. Most of the khachapuri recipes I found were cheese-only, but I needed some vegetables in my life and decided to make mine into a broccoli cheese soup inspired version. 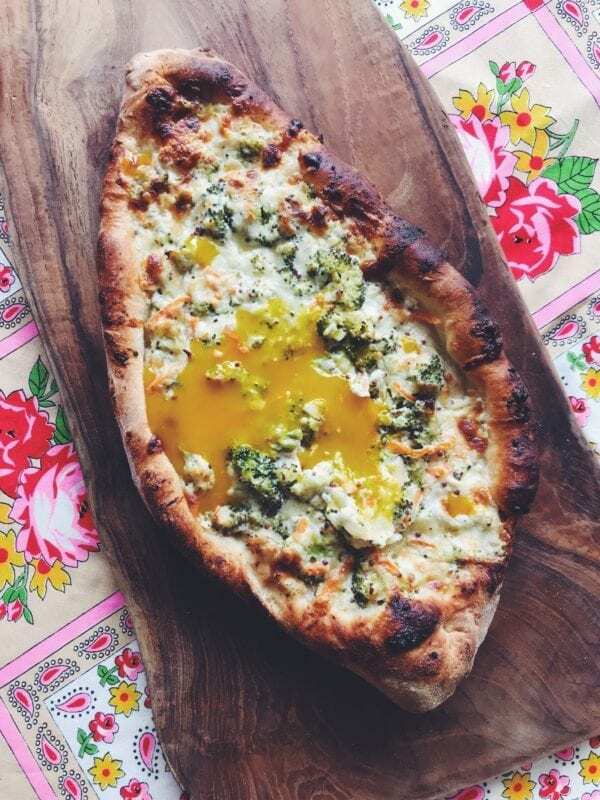 Well hello creamy garlicky broccoli cheese boat, you are making my Friday night so much better ?? Ever had Khachapuri? Neither have I ? but decided that I didn’t want to live like that anymore. I kind of created my own version using pizza dough + inspiration from a flashback of that panera bread broccoli cheese soup bread bowl life that I used to live off of in high school. Dudes, get on this!! ??? Looks ridic, right? BECAUSE IT IS! So I’ve talked nonstop about the filling but what about the bread? A lot of the recipes I looked at called for making your own dough, but if you know anything about me, you know that I can’t be bothered with anything baking-related. Instead of making the dough myself, I decided to buy a ball from Publix because they are better at it than I am. But hey, don’t let me stop you! If you like baking? Then go for it! Preheat oven and pizza stone to 400 degrees. Meanwhile, divide room temperature dough into two halves. Roll out the dough into an oval shape. Carefully roll up the sides and pinch the ends to create a boat shape. If you’re having a hard time getting it to stay, simply roll the dough a little tighter and pinch the dough in place with your pointer finger and thumb. In a medium sized bowl, mix together steamed broccoli, carrots, shallots, ricotta, mozzarella, feta, milk, grainy mustard, garlic powder, and season with salt and pepper to taste. Take pizza stone out of the oven and dust it with cornmeal or a few tbsp of flour to keep the dough from sticking. Place both dough boats on the stone and fill each with half of the broccoli mixture. 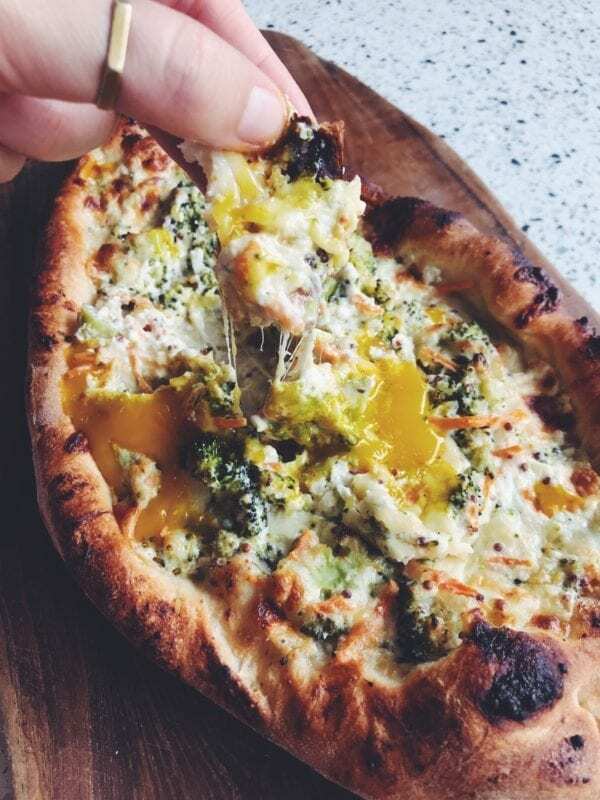 Bake for 20-30 minutes or until dough is browned and broccoli cheese mixture looks hot and bubbly. Remove the cheese boats from the oven and carefully set 1 egg yolk in the center of each boat. Serve immediately, using the outer crust to stir and scoop out the creamy center. Enjoy! I’d like to think this would be a fun appetizer to share with friends before going out, but honestly, there’s no going out after eating one of these. Tbh, I took a 4 hour nap after recipe testing. Woof. It was intense. So if you make it, be sure to invite some friends over, get into some sweat pants, pop on a movie and enjoy. You probably won’t leave the couch afterwards. This sounds amazing! I love me some broccoli cheese anything! Question, though: you don’t cook the egg yolk? We just plop it right on top and let whatever heat from the cheesy goodness soft cook it, right? Probs making this sometime this week since we have an onslaught of chilly weather invading us here in North Texas. Yes to your question! It sort of has like the same effect as a poached egg yolk with the residual heat! not to be a nitpicker but I don’t think khachapuri has anything to do with Hungarian cheese. I say it as a Hungarian who loves Georgian cuisine (khinkhali for life!!!) What kind of cheese did you mean? You are so right!! I edited it. It’s a georgian cheese called sulguni… Maybe I was just too hungry and wrote hungarian? Lol. sorry about that and thanks for catching it!! I can literally never roll out pizza into a circle so this might be my new favorite trick tbh. Thank you for making such awesome recipes – the cheese pulls have me literally drooling. Like I have to wipe my chin.